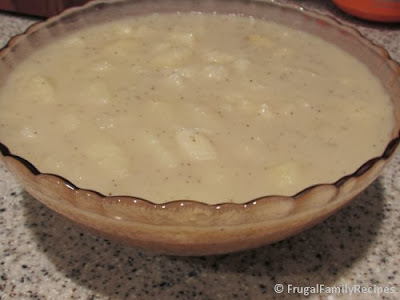 Old Fashioned Creamed Potatoes - Like Grandma Used to Make! Here's another frugal family recipe that I should probably make more often because they are just so good! Creamed potatoes are a Southern delicacy. They are also easy to make, easy on the grocery budget and a nice change from regular baked and mashed potatoes. 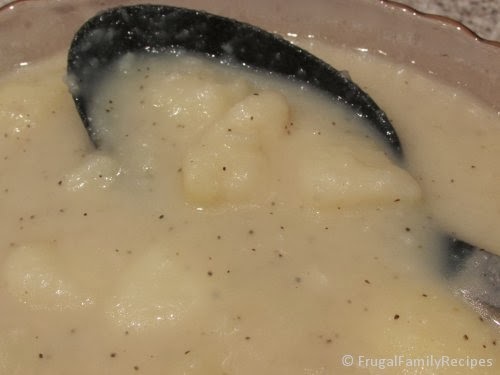 I learned how to make creamed potatoes from my mother-in-law many years ago and I'm sure she would love my version too. They are still just as creamy and prepared like grandma used to make, only with a little more seasoning. I hope you enjoy them as much as we do! In a large pot, add butter and bacon grease (reserved from making bacon), then set aside. Cut potatoes into large chunks, they will be smaller after cooking. I generally cut the very small red potatoes into quarters and the larger ones a bit more. Place cut potatoes in pot. Add salt and pepper. Cover potatoes with water (if 4 c. is not enough, add more). Bring to boil over med-high heat, uncovered, stirring occasionally. As potatoes begin to cook, lower heat and continue cooking until they are very soft. At this point you will need to stir them gently so they do not turn into complete mush. They will be soft, but you want them to remain in chunks. Once the water has thickened like gravy the potatoes are ready (total cook time approximately 45 minutes). Remove from heat, add milk, stir gently, and serve warm.